Prosecutors said she also helped Iran target her former American colleagues. The Justice Department announced on Wednesday that it has charged a former U.S. Air Force counterintelligence specialist with spying for Iran and helping that country target her former American colleagues. Monica Witt, 39, who was also a Defense Department contractor after leaving the U.S. government in 2008, sought to "undermine the U.S. and help the government of Iran," U.S. Attorney for the District of Columbia Jessie Liu said on a call with reporters. Witt had been given high-level security clearances and had been deployed to the Middle East, prosecutors said. Witt attended an event in Iran in 2012, sponsored by Iran's Islamic Revolutionary Guard Corps, called the New Horizon Organization’s “Hollywoodism” conference, aimed at promoting anti-U.S. propaganda, prosecutors said. The U.S. says the IRGC is linked to terrorism. 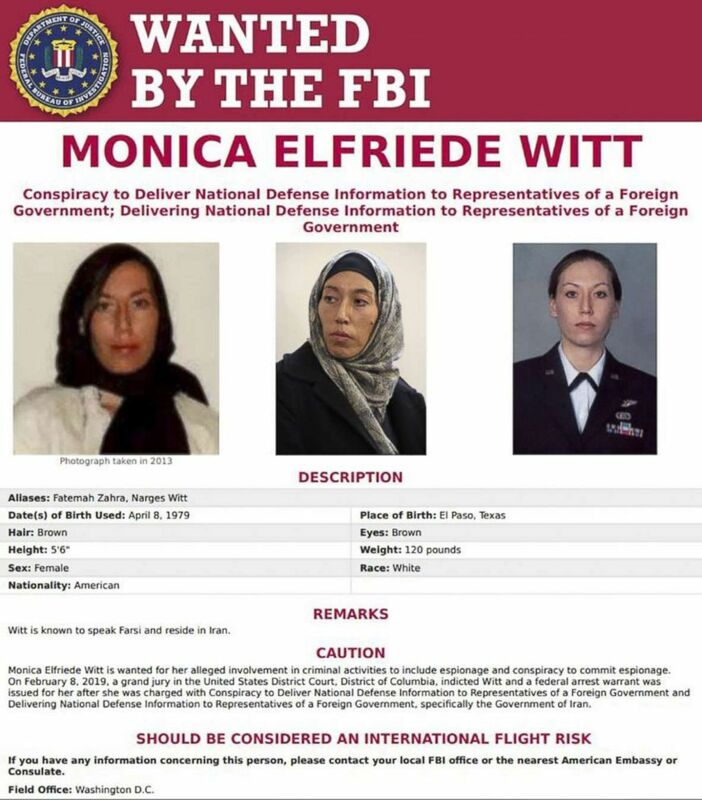 (FBI via AFP/Getty Images) Wanted poster for Monica Elfriede Witt,39, a former US air force counterintelligence officer. "As part of her work on behalf of the Iranian government, she conducted research about [U.S. intelligence community] personnel that she had known and worked with, and used that information to draft “target packages” against these U.S. agents," a DOJ release said. She is "alleged to have disclosed the code name and classified mission of a U.S. Department of Defense Special Access Program," the DOJ said. Since 2012, she appeared in anti-American propaganda videos in Iran and texted the unidentified U.S.-Iranian citizen who had applauded her training, saying, ”Well I loved the work, and I am endeavoring to put the training I received to good use instead of evil," according to the indictment. She later texted that same unidentified citizen, “If all else fails, I just may go public with a program and do like Snowden." 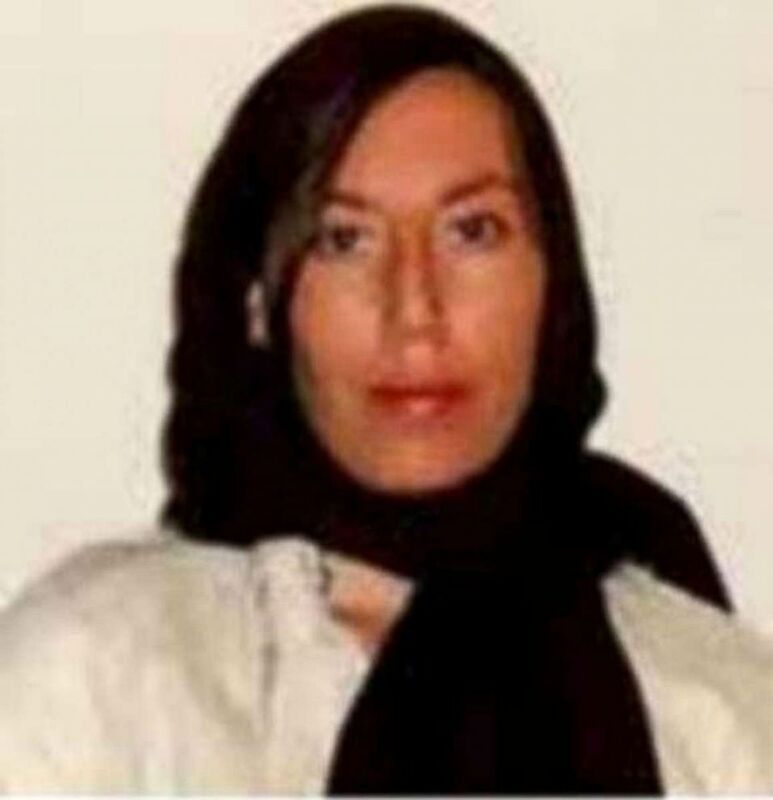 (FBI/Reuters) Monica Witt, 39, a former U.S. Air Force officer, indicted for aiding Iran, is seen in this FBI photo released in Washington, DC, Feb. 13, 2019. "In other words, she decided to turn against the United States and shift her loyalties to the government of Iran," the FBI said. DOJ also said it has indicted four Iranian nationals for cyber crimes. Prosecutors allege that the four charged Iranian nationals "Planted spyware and malware on current and former U.S. personnel." Witt, according to federal prosecutors, targeted her former colleagues through the Iranians. "New Horizon hosts international conferences that have provided Iranian intelligence officers a platform to recruit and collect damaging information from attendees, while propagating anti-Semitism and Holocaust denial. We are also sanctioning an Iran-based company that has attempted to install malware to compromise the computers of U.S. personnel,” Mnuchin said in a statement.